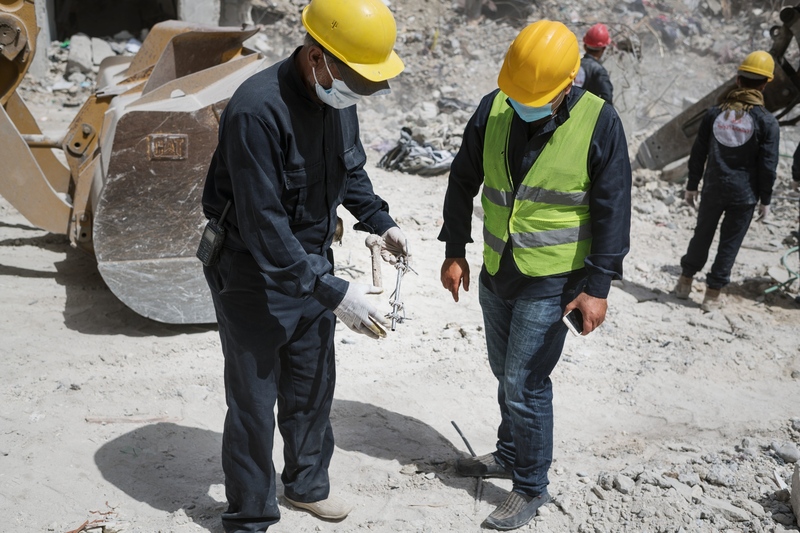 The first responders team in Raqqa are searching for bodies and human remains in Hay al-Beddo, "the beduin quarter" in Raqqa. They have found around 30-40 bodies in this spot. Digging with tractors and heavy machinery and then manually going through the gravel and debris. 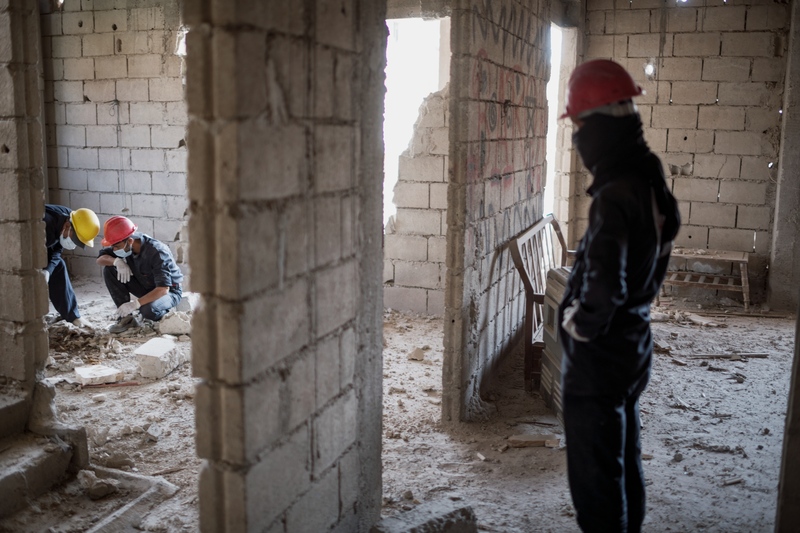 A member of the the first responders team in Raqqa shows a piece of a bone to his supervisor. 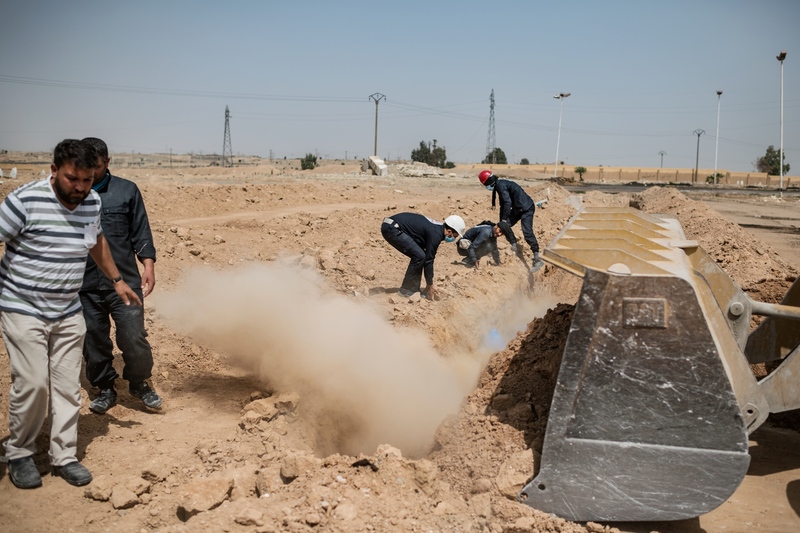 They are searching for bodies and human remains in Hay al-Beddo, "the beduin quarter" in Raqqa. They have found around 30-40 bodies in this spot. Digging with tractors and heavy machinery and then manually going through the gravel and debris. 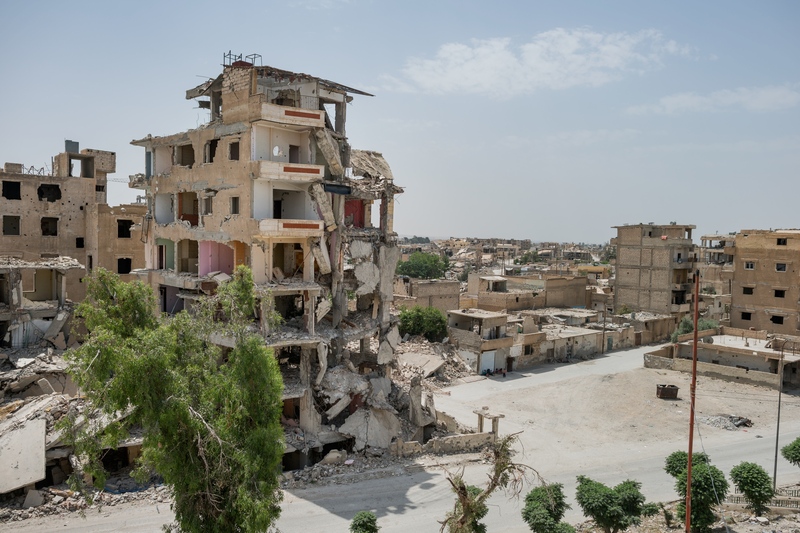 The view from one of the still standing buildings in Raqqa. 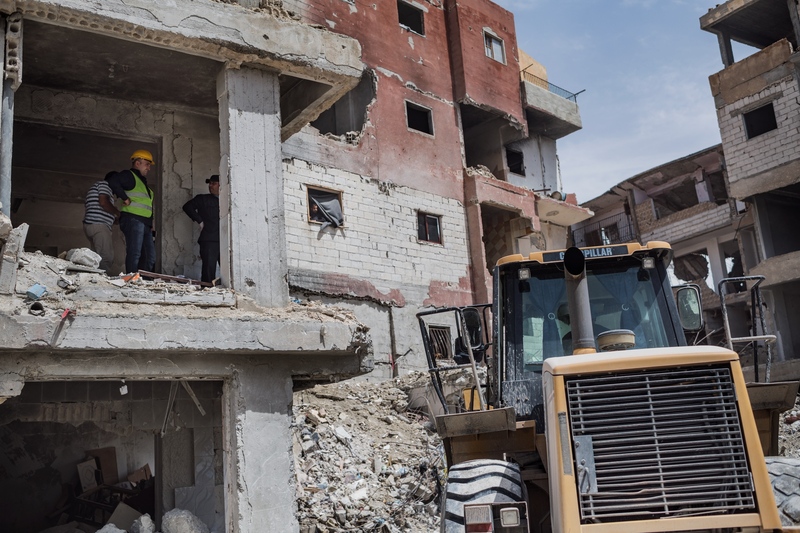 About 80% of the city is estimated to have been destroyed due to the heavy fighting against Daesh. 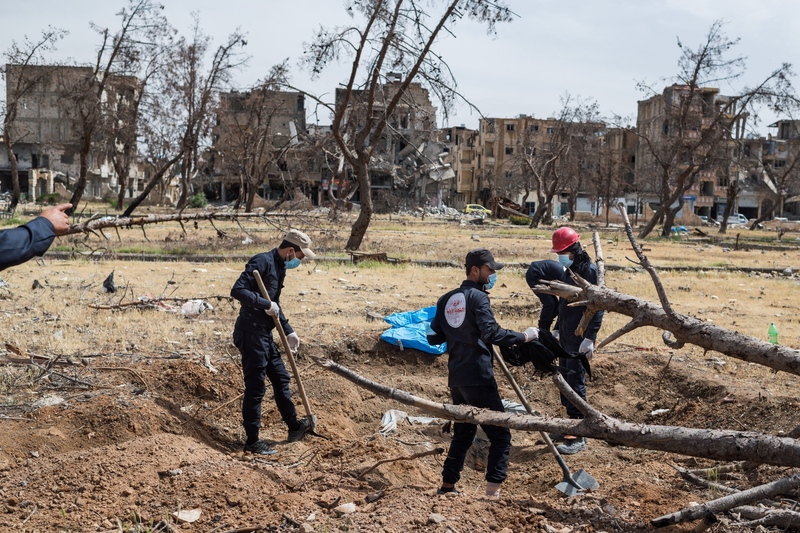 The first responders team in Raqqa are searching for bodies and human remains in Hediqat Al-beida, "the white park" in Raqqa. They say that this particular spot seems to be a mass grave and that they expect to find at least a hundred bodies buried here. 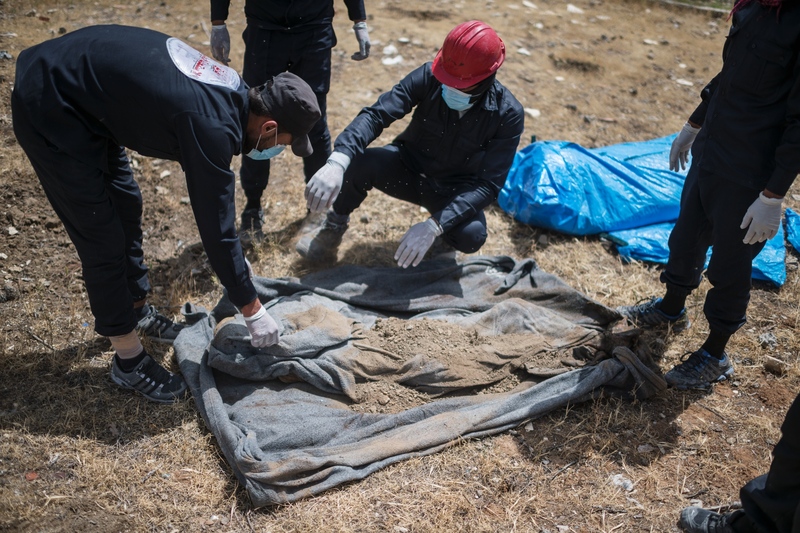 The first responders team in Raqqa uncovers the remains of a woman after searching for bodies and human remains in Hediqat Al-beida, "the white park", in Raqqa. 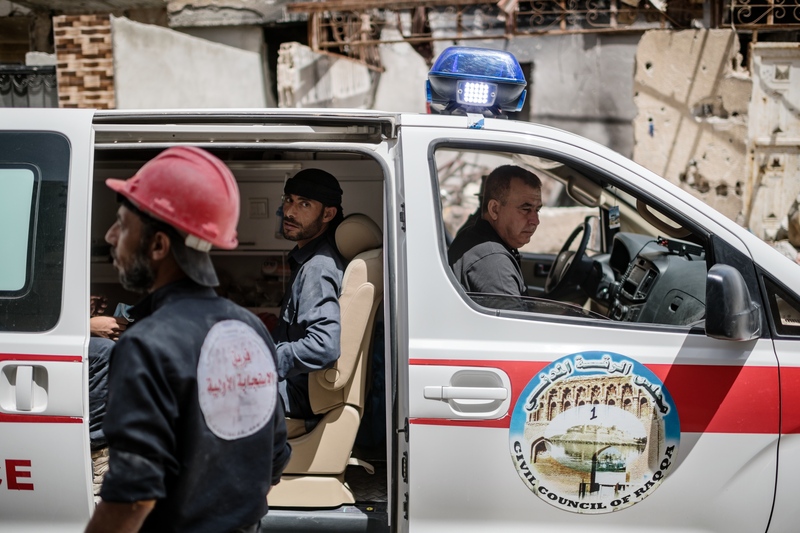 The first responders team in Raqqa are getting ready in an ambulance. Someone has called and complained about the smell in a resident building. The first responders team have found two bodies on the second floor of a residential building. They are trying to check for improvised explosive devices and state that the bodies have remains of suicide vests on them. The first responders team have found two bodies on the second floor of a residential building. 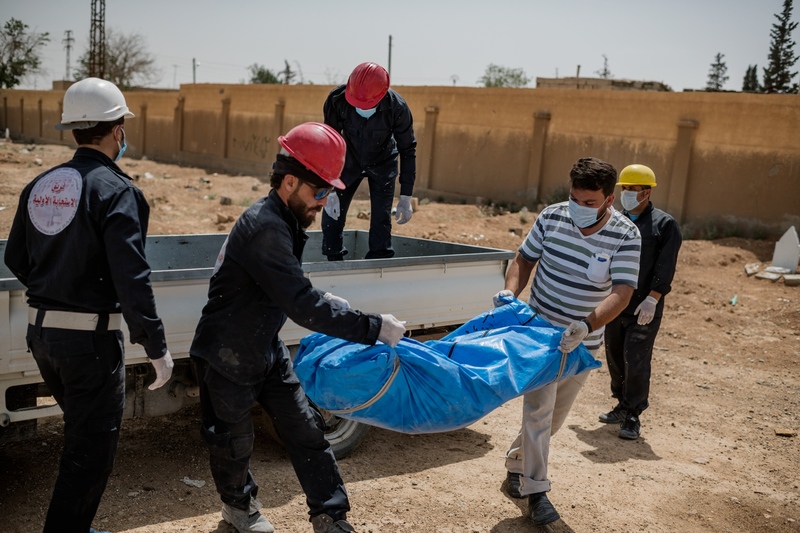 They are trying to check for improvised explosive devices and state that the bodies have remains of suicide vests on them. After seeing that nothing exploded they start scraping up the human remains and put them in a body bag. The first responders team are disinfecting and washing as curios bystanders are watching from across the street. They just cleared two bodies on the second floor of a residential building. 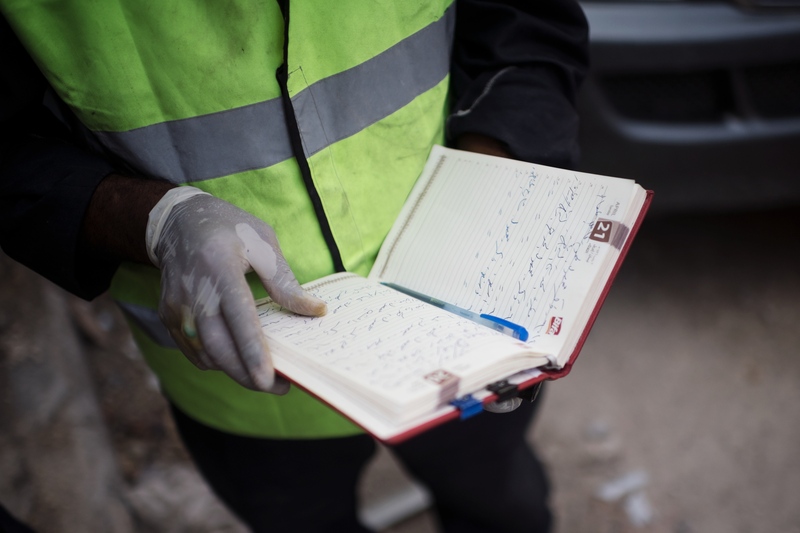 Since October they have been digging out between 10 and 25 bodies every day. 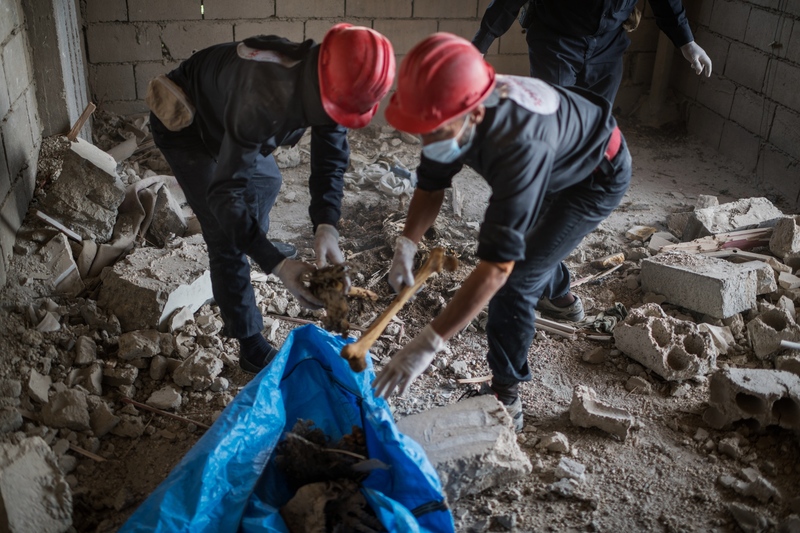 The first responders team in Raqqa are collecting and counting the twelve bodies they have found this day. 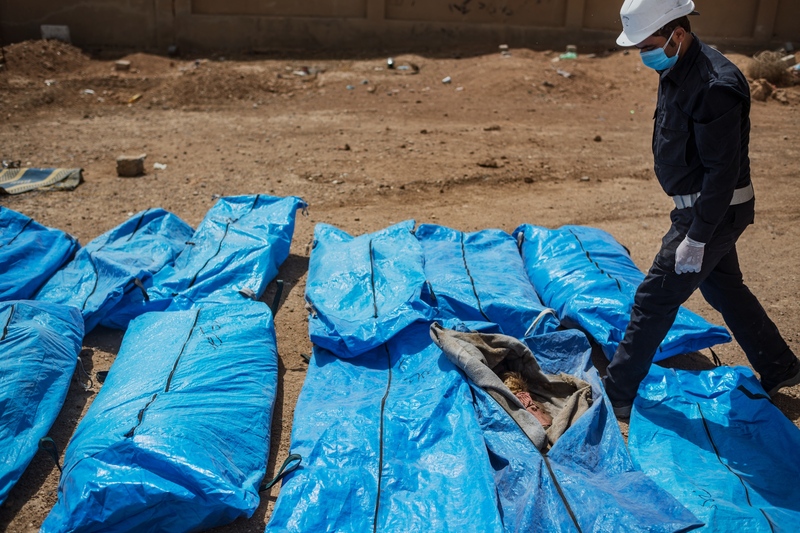 At the end of the day the team brings all the body bags to a graveyard outside of the city. The supervisor opens up one of the body bags and shows the remains of a small child inside. They say a short prayer before putting the bodies into another mass grave. 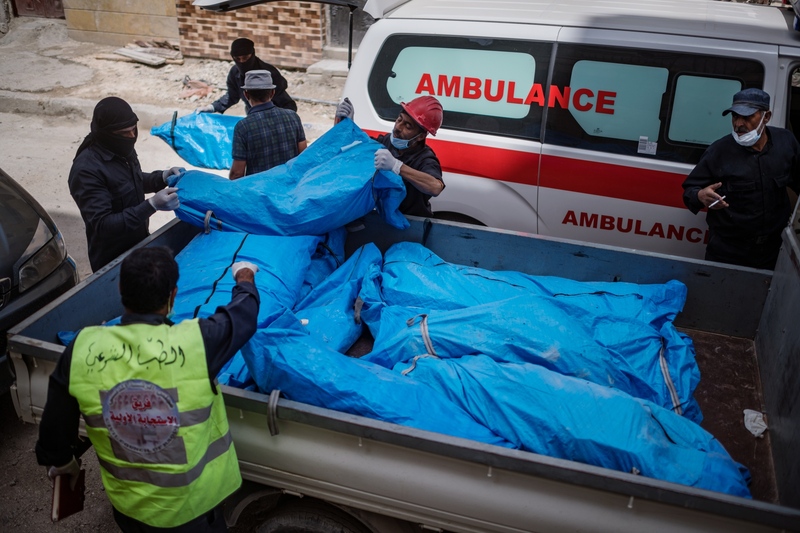 All the bodies are put in the same grave, Daesh fighters next to their victims. There are simply no resources to try to identify the remains they find. 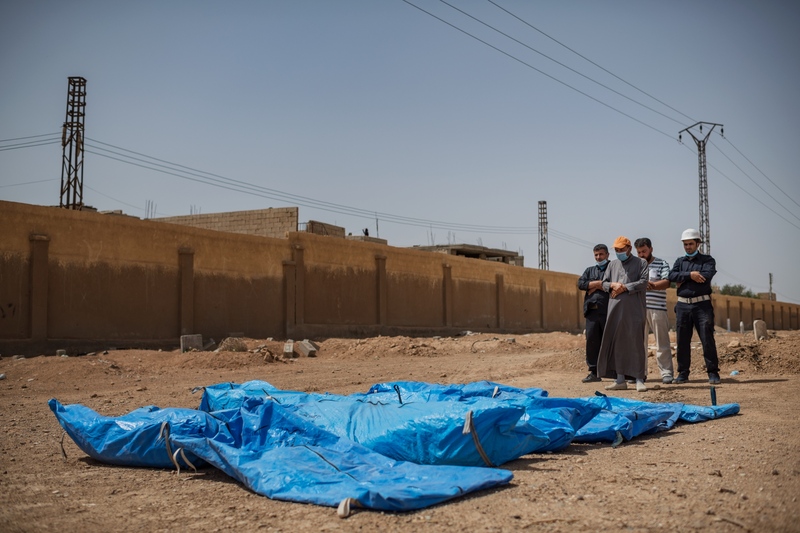 Death is everywhere in Raqqa. 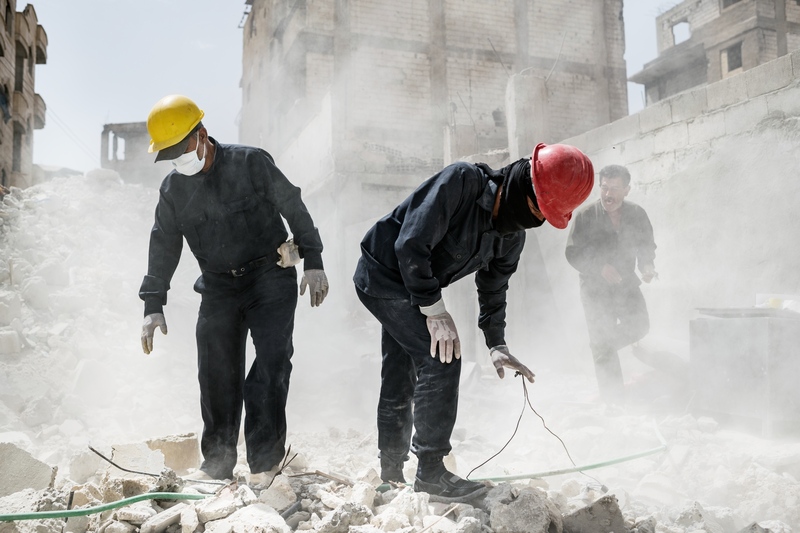 Sometimes it lurks beneath the mountains of bomb-blasted rubble and pancaked buildings. Other times it peeks out from beneath the earth in the form of bones, hair and decomposing flesh the colour and texture of ancient dried parchment. Often it moves around the city, its stench drifting on the humid breeze, creeping into the nostrils and psyche when you least expect it. 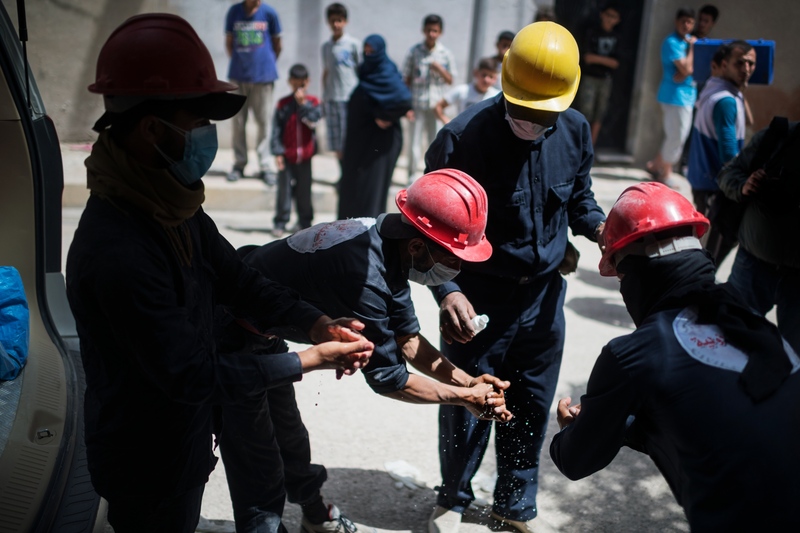 More than anyone else here, the men of Raqqa’s Civil Defence Unit know where death can be found. For going on six long months now they have sought out its many locations and collected its gruesome detritus along the way.